The problem with heart attacks, in particular silent heart attacks (no chest pain or other symptoms) is that damaged heart muscle once scarred takes a long time to heal. Whereas cells such as those in the skin are replaced every few weeks, the heart muscle cells you were born with are still pumping blood in your adult years. Once you damage these cells, they are not quick to be replaced. Scarring (fibrosis) is likely a problem that prevails for the remainder of life after a heart attack. So it is critically important to protect heart muscle cells should a heart attack (a blockage of circulation to the heart) occur. Actually, the damage done to heart muscle occurs when the blockage of a coronary artery is opened and oxygen is supplied. At this moment, oxygen radicals are created that damage heart muscle. For decades it has been known that molecules in wine such as resveratrol activate internal antioxidant defenses prior to a heart attack and limit damage to heart muscle. That would be a distinct advantage modest wine drinkers would have. Of course, for ethical reasons, this has only been demonstrated in the animal lab, there are population studies that bear this out for wine drinkers. But overseas researchers reported on a remarkable study that should have made worldwide news headlines. They took animal hearts (rodents) and experimentally induced heart attacks by crimping off circulation in coronary arteries and then re-supplying blood circulation that resulted in injury to heart muscle (called ischemia/reperfusion injury). They then conducted the same experiment giving these lab animals the red wine molecule resveratrol and/or vitamin D prior to the heart attack. 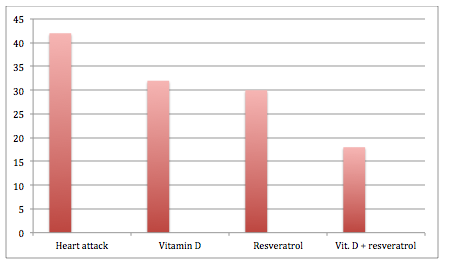 The amount of vitamin D was modest, equivalent to about 70 micrograms = to 2800 international units (IU). The amount of resveratrol was equivalent to 70 milligrams in a 160-lb (70 kilogram) adults.